NCFC begins tonight, and this year will be awesome as always. Last year AM2R made an appearance in its own booth, it was the first time the Alpha Metroids were shown to the world. I´ll post the material here after the convention is over, don´t worry. Unlike last year, I´ll be appearing every once in a while in the NCFC chat. If you want to exchange some words with me, come by the chat room. I´ll be online tonight during the opening ceremony. Comments about the new material are welcome. I read the ones of the last post, and I was really tempted by some of the ideas you shared with me. The limit here is my time, and the ammount of effort I can put in the project right now. Well, enjoy the Nintendo Community Fangame Convention. Will you reveal what suggestions you will implement, or will you maintain it a surprise? -Show an X parasite getting eaten by a Metroid somewhere. This could be in a cutscene of some sort right before Samus enters a room. This allows the player to see it without breaking the canon. It could also be somewhere in the background or in such a way that it's unremarkable and Samus might not notice or place any special interest on it to still not break the canon. -Buffing the Omega metroids so that they are actually the strongest. They were too weak in the original and surpassed by the Zetas. Hopefully you won't nerf the Zetas too much even with the removed flight. -There should be two types of lava. The normal type that Gravity Suit protects you from, and the Superheated type. The superheated lava should be used for progress blocking, boss fights, and possibly secret areas or any possible escape scene. It could be denoted by a darker red color, heat waves, and/or more violent bubbling. Gravity Suit could of course reduce the damage from it. -If you do show a Zero Suit style Samus, remember to use purple suit and brown hair. She hadn't switched to blond hair and a blue suit yet. -An SA-X style chase scene. Before you have the ice beam, having a metroid chase you would be awesome. I loved that style of gameplay and I really think it increases the suspense in the game. (You could also find a way to work in another similar thing later if you have a type of metroid or enemy that requires a better weapon you don't have or an ice beam upgrade or it's armored due to some special event or something.) Basically, this type of thing is great and if you could fit in 1-2 escape scenes that would be amazing. 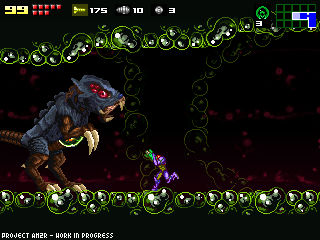 -Seeing a metroid eat would be awesome, even feeding on normal life. As would seeing it eat and then metamorphose. Again, this could be a cutscene or a background type thing and doesn't necessarily have to be interactive. This could also be linked to my previous mention of an X Parasite cameo appearance. Overall most of these ideas aren't mine and I'm not taking credit for them, but they are some of my favorites. I think some of them could improve strategic gameplay and/or really add to the story or overall feeling of the game with added storyline depth through a few cutscenes or chase scenes. I Saw your new video on YouTube, Zetas look awesome! Just one complaint though, if they are reall fast, and jump high, shouldn't their legs be more muscular. They looked a bit disproportional to the zetas body. I love the erieness (is that a word?) of the redone Lower Norfair soundtrack and the corridor with the hopping robots looks very cool. Keep doing what your doing Dr. M! Good point about MZM, I had forgotten it's silly canon change. I guess that's entirely up to DoctorM64 to decide then. Btw, if anyone at the event could do a list of all the Metroid fangames that show up, that would be great. I won't be able to attend, but I would love to hear about any other good Metroid games that are coming out or any news about old ones that I previously thought were canceled. oh, seeing as how you didn't post the video on this post, i thought you didnt make one yet. amazed by some of the new areas you've shown. i can see that this game will be FUN! i know you're in charge of this project and what you say goes, so all i can do is comment. i don't really agree with how much you changed them from the original/metroid fusion look. 1. you gave them a neck. they appear to lack a neck in the other appearances, so even if they had them, i doubt they'd be long and skinny like you made them. the omega's have a short neck but it is very thick. 3. again with this metroid and the other 2, i still feel as though they aren't really alive. they're just moving, but they're not really "breathing" or moving within themselves. an example would be to make its teeth open and close like the omega did whenever it walked (in fusion) or just simply make their whole bodies move up and down a few pixels. i hope you consider this, I'm still your number one fan and i check your blog every day. It's looking great since I last saw it! You might not remember me (Timmehboy) but I offered my help on the sprites, but for now they're looking great! I can't wait for the next demo! just seen the preview 4 video. but yes i dont recall zetas having necks, small feet and hands... maybe you will update those sprites once everything else you are doing is working well. there was a reason that the X werent around on SR388, because the metroid ate them all... but i dont truely feel it necessary to show the X since we dont deal with them on this mission. but yeah it would be cool to see a metroid eat something before it has a growth spurt. perhaps another local enemy? there usually is 2 types of lava, 1 which is your basic heated volcanic lava that doesnt take damaged with the varia suit, and then there is acid lava which does still take damage no matter what. this coincides with super metroid. oh yeah and i noticed you added the stackable beams.. very cool. I think you should have it beam stacking just like Super Metroid, Fusion, and Zero Mission. That's the best way to do it. Anyway, this is AmyYatesRIP saying keep up the good work! 4. oh i forgot to mention. the Zeta's have long tails too. So i'm not sure why yours have no tail at all. The omega's have the same tail but it looks cut off. thats about it. neck, tail, small legs/feet, and motionless. Its funny because the theory that some people were proposing about a cutscene in which samus sees a metroid eating an X parasite would be right if the creator of the game and the game itself were spanish, cuz in the spanish version of M fusion Samus just says that she was attacked by an unknown being but she does not say anything about if she had seen it before, just that she didnt know what the creature was. Overall, this looks like zero mission on crack. No, not crack. Phazon. This is MZM on highly-concentrated crystal phazon. The backgrounds were incredibly, the dynamic enemy animations were better than anything I've seen in a 2d game before (professional or otherwise), and that hive-tileset would make H.R. Giger weep tears of joy. I think you owe yourself. My one point of contention is regarding the zeta metroid. It looked really, really creepy, but it also looked...well...toylike. The sticklike limbs and neck made it look kind of like a really messed up puppet on strings. The messed up part was awesome. The puppet, not so much. Maybe when you find the metroid hatching and got to the surface, there could be a beautiful sunset along with the feeling you get when you find the hatching metroid and go to you're ship. Also, n the original the entrance to the sr388 caves are blocked when you defeat the queen metroid, maybe you can see the rocks falling down from the ceiling and block the exit after you enter the cave the first time or after you have defeated the first alpha metroid. I forgot to tell you about the new contents, and i must say that the tiles, sprites and animations are marvelous really, for example the robot is even more real than a robot that nintendo could create. But in the other hand i have 2 say that you should redraw some aspects of the zeta metroids as others said. They MUST have a long tail. They shouldnt have neck and also they shouldnt have such a long legs. To conclude, i would want to supplicate u not to create a new omega having thhe Fusion one. Some have called for you to redraw the Zeta sprites. I can see why this might be an issue with some people, as it is quite a bit stylistically different from the look of the Omega in Fusion (which itself may have been a bit overly cartoony, but still. If it's going to take a large amount of time to retool it, don't bother. At least not in this release. It's consistent with the style of the metroids we've seen so far... just not necessarily with some aspects of the Nintendo animators. If you do plan to redraw it, wait until after you release version 1.0 of the game. I don't think you should get bogged down in such a thing for another month or so, and I don't want you to end up rebuilding them from scratch when it looks like you've already got a good thing going. Still, if you do decide to touch up the Zetas, make them a bit more animated. Give its mouth some movement. Really, do what you want to do. I see why there's some criticism, but they're by no means a bad piece of work either. The one guy who called them "unacceptable" on youtube is full of it. I completely agree with those, however, considering the prime games came before Metroid 2 and in Prime 3 Samus has Blonde hair and Blue Suit the Zero Suit Samus comment is false...I don't like Samus's Blue Suit and Blonde hair though so it'd be cool if you changed her look back to normal. Another suggestion that you're probably already implementing...I think you should add a few more non-metroid boss battles...it gets boring fighting the same bosses repeatedly...maybe you could even switch it up a bit by making a zeta metroid fight and then an alpha metroid fight, of course you'd have to make some changes to enviorment to hinder Samus's power if you did that because otherwise the Alpha Metroid would be overwhelmed at that point. The zetas are really nice. Maybe they´re not too close of the truth but i think the don´t need at all to be redesigned as some people claim. i like the aesthetic you've used with the zeta, but it's head is too long. it looks like a hot dog, whereas it should look more like a goldfish cracker. To those who suggested changing Samus' zero suit look. Don't change her hair color, but you can change the color of her outfit if you like. It might not be a good idea since this game probably takes place not terribly long after Metroid Prime 3 (where her zero suit is clearly seen and the same as always), but if you want to give her a more retro outfit, I think it'd be interesting. Also, if you have the zetas done, there can't be much left for you to do. Any way we can get a progress report post here? Even a slight hint of a release time period? I'll be patient, but I look at this blog every day waiting for this project. I care about it more than Metroid: Other M! I liked how the Gamma metroid looked, but from the 2sec shown of it in the video, he still looked pretty stiff. I'm guessing the leg animation is still in the mid-early stages. One thing that would make the leg swing look more fluid and natural is to make the front legs begin to swing forward a frame or two before the back legs begin. I like the dead gamma shell in the zeta intro. It looked good. Only thing that would have made it look better is if the Zeta burst out of the shell, using it's head to break free with a mighty thrust upwards and shell pieces flying everywhere, instead of the Zeta gently rising from the shell/ground. The Zeta metroid I'm not too happy with, but I think I see where you are trying to go with the design. You are choosing to take a more continuous evolutionary development where the gamma grows into a zeta by developing slightly thicker legs and arms from those little dangling stalks the gamma had, which then leads to a nice easy translation in both size and features, to the fusion Omega without need for scaling the sprite down. So I'm guessing the Zeta is modeled after an Ostrich, which fits with Docs intention of making it more of a fast runner and jumper than a flier. That being said, I'd like to see the Zeta do a head ramming attack with that big potato head of his. I miss the fireballs that came out of the old Zeta's mouth, which looks like it's replaced by a weak looking version of the omega's claw attack. I really don't like the Zeta's huge floating head, especially with it's eyes in the center of the oval, they would look better closer to the mouth. The main body looks fine, if you are going for an Ostrich look; I like the glowing belly. The tail looks like more of an after thought, but here's where you would see the Orange-sh segmented tail as seen on the omega and queen. The only major problem I'm seeing is the inconsistency of the graphics. I hope the artist you're working with is capable of making sprites for everything you have. That way, everything would meld together nicely and wouldn't clash. by the way, I love how the metroids look. (though I agree, they should be a little more animated). They're very much what I would expect the classic metroid to be with better graphics. Very creepy. ^ I came here to post the exact same thing. While I like the look of the Zeta, it blends into the background and lacks the vibrancy of Samus and all the other sprites. Aside from that, a random blink and some breathing, and preferably drooling, would indescribably improve the metroid's realism. wow, nice zetas man, seem to have hard work on their backs. I must agree with the other people, in fact they are really good, but they have a lack of life. Still need some extra animation and fixes. Keep up your great job doc ;). Like everyone else, I like the Zetas but think they need to be more animated. Maybe you could do things like making its eyes blink, opening its mouth to make sounds, having its head bobble up and down when walking, and having its arms move around a little. I think you should follow some of the suggestions about changing the Zeta’s appearance, but don’t waste several weeks on this. On an unrelated note about sprites: if you are looking for the omega metroid sprite or even other metroid sprites, you should take a look at a website called the Shyguy Kingdom. If that doesn’t work, search “metroid sprites” on the internet and you will quickly find it. It has many spritesheets of various things in the 2d Metroid series, including some fan-made sprites. There is also a Crocmire sprite under the minibosses section that was originally meant to be in Zero Mission, but it was never actually used in the game. This new Crocmire sprite could be a boss somewhere in the game. I know you don’t want any space pirates in the game, but I don’t think Crocmire is one. Some thoughts about the games scenery that I have seen so far: You should make the main cave for each of the main areas fairly large. The level design tends to get compressed when switching to a Zero Mission-like style (This was evident in the NES Metroid to Zero Mission.) I always liked in the original M2 how humongous the caves felt. They gave you that, “Did I miss a hidden passageway in this area?” feeling. I saw on your new video footage of the spiked vine filled passageways. The vines look great, but I think you should also have some normal platforms there to balance out the way those passageways look. By the way, are you going to post some of your new videos under the video section of your blog? Wow, it's hard to believe a year as already gone by since the last NCFC. Well it's great to see all the work you've done so far, can't wait to see what you have in store for the NCFC. I took a look at that fourth preview vid of yours, and while I would never even come close to the quality of the Zetas that you have produced, when I saw your version of them I was a bit disappointed. At the very least, your going to have to create completely original Omegas to match. No modified Fusion rips for you. On the plus side, I'm really digging the particle effects you used for the robotic enemies. If you could somehow integrate that type of effect on certain organic targets (without making them look misplaced), such that we could all leave a bloody mess in our wake, that would be awesome. Llevo siguiendo tu trabajo muchisimo tiempo, doctorM64. Creo que sobra decir que si sigo tu proyecto, si todos los dias me meto con la esperanza de que hayas actualizado, aunque sea una pequeña noticia, con la misma o más ilusión aún que cuando espero ver en meristation una noticia del metroid other M o de el zelda de wii, esque me impresiona lo que estás haciendo. Tienes todo mi apoyo, como el de toda la gente que te visita, supongo que muchos como yo, a diario. Suerte en el NCFC, saludos desde españa. I think it may have been a bit too early to show of the Zetas, they clearly need some work. My main gripe with them it that they don't really stylistically mesh with the other metroids, so a slight redraw might be necessary. For reference this is how all the metroid, up to zeta, look in Fusion (link). Your alpha and betas seem true to Nintendo's designs but your Zetas are way off. Though, that being said, very nice work indeed. I can´t believe they didn´t give you the best of the show award, you just deserved it. I watched preview 3 again today. About 30 seconds in, you showed a comparison between the hall before an item room in the original and AM2R. The new hall you created looks very cluttered. I prefer the style the original M2 had with the open chamber. I think it made the game more realistic and more atmospheric. Wouldn’t you expect to see large, open chambers if you were in real-life ruins? I think the zeta's a pretty epic too. I just find it a problem that until now, everything has been about improving the original, not changing it. If DOC decides to keep this look for the Zeta's, then the omega's and the queen will have to follow this big change. because i am a metroid fan, i ask DOC to please go back and redo the Zeta's. All i want is the neck gone and a tail added. it really shouldnt be too hard. and dont be like "i've already shown it to the public and it's humiliating to change what i've finished". I know you can do it. estas escuchandonos verdad? parece que la majoria de los fans que te sige con este projecto quieren que esto pace. almenos consideralo. Hey que onda doctor, por lo que veo no quiso agregarle el escape por lo que dicen alguno comentarios bueno hubiera sido genial para así no igualarlo como el Metroid con Metroid Zero Mission que cambia mucho el final, no crees, bueno al fin te deceo suerte con tu proyecto e estado impaciente por ver como termina, de seguro vas a publicar otro demo verdad, solo es de esperar, Ok entonces suerte con tu proyecto, gracias por estar asiendo esto por nosotros sin nada de ganancia.